Impossible Things, Connie Willis, Bantam Spectra, 1994, ISBN 0-553-56436-6, $5.99, 461pp. A collection of stories by Connie Willis, one of the modern masters of the science fiction short. “The Last of the Winnebagos” — I remember reading this story years ago and not caring for it that much. Rereadiug it ten years later, I find it much more appealing. In one sense it is a mystery story; in another it is a cautionary tale. The way that Willis weaves together the two– the tale of the dead dog and the new, authoritarian society–is fresh and clever. Sentimental? Yes. But in the best way. “Even the Queen” — One of my favorite stories, not just because it flirts with taboo, but because it is written with such an easy and joyous manner. Willis’ comic stories are like those by Wodehouse–she is never content with a single gag, but can mix in wordplay, pop references, slapstick, and play off the old cliches in new and unpredictable ways. “Schwarzchild Radius” — Just so as you don’t get the impression that I worship the paper that Willis types upon, I will gladly admit that I don’t care for this particular story. 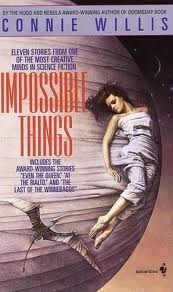 I believe that this was one of the first stories in which she portrays a physics concept in characters and setting. Later on, in “Blued Moon” and “At the Rialto,” the same method, when used with comedy, works to much better effect. “Ado” — One of the comedies that has not aged well, due partly to the backlash against “Political Correctness” of which this story was only a small part. There are parts that are still funny, like the running battle between the teacher and the sun worshipping student fought with Bible verses, but the end less litany of offended organizations goes stale about halfway through. “Spice Pogrom” — This is the kind of comedy that will never die; well, at least I hope it won’t, because, like Willis, I am enamoured of the screwball as nothing else. Yes, it may seem as formulaic as any pulp adventure, but it has at its core some thing that no mere adventure story has, and that is a true sense of romance. We may want to be the Lone Ranger, but we know in our hearts that we can not ride Silver. On the other hand, with a little wit and luck, we are able to be romantic and silly–it is closer to us. “Winter’s Tale” — One of the reasons Will is appeals to me so is that I share so many of her interests–screwballs, P.G. Wodehouse, and William Shakespeare. Here the scholar in Willis truly shows, similar to her wonderful novel Doomsday Book. A great story and a history lesson–what more can you ask for? “Chance” — This is as close to a mainstream tale as you will ever see in a genre publication (it first appeared in Asimov’s) but it is the kind of story that is popping up with more regularity in small-press literary and mainstream magazines. “In the Late Cretacious” — This is another one that did not age too well. Basically, it tries to put a comparison between academic competition and the evolution of dinosaurs, along with a running joke on parking. Bits are funny, but the whole is tired. “Time Out” — Another one in a similar vein, although in the end it feels more like “Space Pogrom” then “Ado.” The comedy is present, but more organic–not relying so much on repetition, as it does character. And, while it is a story about time travel, it is also, and more importantly, a story about time. “Jack” — Another war story, but one that I was able to relate to. Loosely related to Dracula, this has some interesting points about war and its effect on people. Much more subtle than normal Willis fare. “At the Rialto” — I like this story. Of course I do–I’m a sucker for quantum physics–but even I have problems following the pattern and ideas here. In this case, Willis worked hard on her research. At least you can read it without understanding everything. A very good collection on the whole, and definitely worth your time.